Webinar Wednesdays: How to calculate Amazon profit, taking into account all hidden fees. Experts of their own right, they will discuss how to calculate Amazon profit, taking into account all hidden fees. Learn how to calculate profits with Vladi Gordon of AMZControl.com after all of Amazon’s numerous fees. 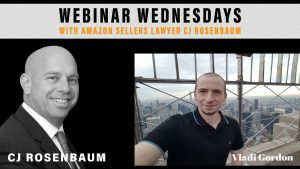 CJ Rosenbaum is the founding partner of the only full-service, international law firm focused on Amazon Sellers. Rosenbaum Famularo, PC, the law firm behind AmazonSellersLawyer.com, has full time staff in New York, Europe and China. CJ’s law firm focuses on suspensions, representing sellers, and brand protection. Vladi Gordon is a co-founder of amzcontrol.com, world’s most accurate profit analytics service for Amazon sellers.